If you are barbecuing steaks or burgers, try grilling up a simple side dish as well. 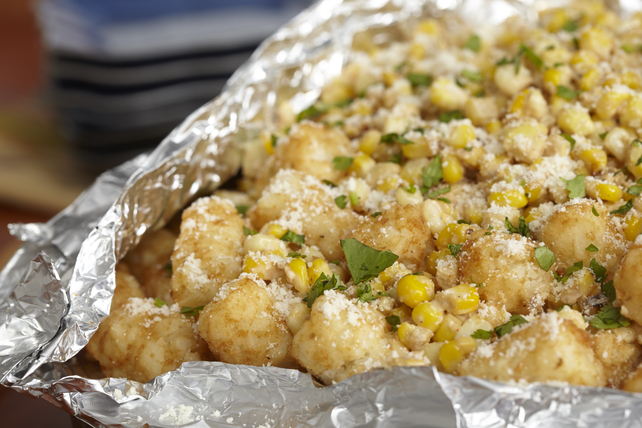 Our Mexican Corn Totchos are a great grilled side! Place potato nuggets on large sheet of heavy-duty foil sprayed with cooking spray; fold to make packet. Grill packet and corn 10 to 15 min. or until corn is tender, turning corn occasionally. (Do not turn packet.) Remove corn from barbecue. Grill packet additional 15 min. Cut kernels off corn cobs; place in medium bowl. Reserve 2 Tbsp. cheese. Add remaining cheese to corn along with the Miracle Whip, lime juice and cayenne pepper; mix lightly. Cut slits in foil packet to release steam before carefully opening packet. Spoon corn mixture over potato nuggets; top with cilantro and reserved cheese. To remove kernels from a corn cob, hold cob firmly at an angle. Carefully cut down the ear (away from the body) with sharp knife, several rows at a time. Two medium ears equal about 1 cup kernels.